Rock Paper Lizard: Terns turfed. There was a super-low low tide today so we headed to Boundary Bay to walk forever on the mudflats. All was going well until it started to rain (which it was not supposed to do--it was supposed to be sunny). Thus we didn't get to the ocean's elusive edge, were chased back ashore. 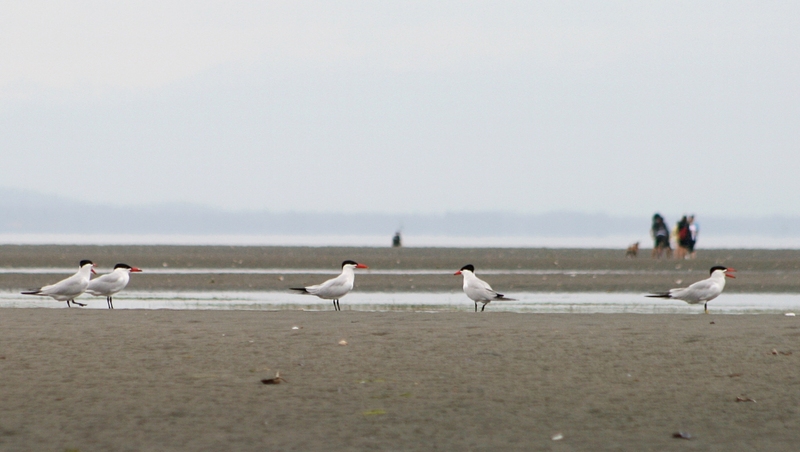 Somewhere in the middle of the aborted mission we came upon a small flock of Caspian terns. There were about 10 birds in total, who seemed to be debating whether or not to hang around on the mud, what with all the humans and running off-leash dogs and inclement weather. They were eventually chased away by a small black dachshund, which is about as sadly ridiculous a thing as anything I have ever seen. At that point I had packed away my camera, which makes it also tragic. I thought I'd seen some of those a week or so ago, but they were too far away to be sure, even with the camera. We were heading to the beach, too, but it started to rain here before we got out. (You should post those photos in the next size up; they're good shots. I opened them in another tab to see them properly. I love that one on the right of the bottom photo, with his beak wide open, talking. I was there Saturday...weather was nicer, but I didn't see any terns. I often heard terns screaming over Richmond but never got a good look at them. Rather comical looking really, especially that one with his mouth open complaining about the dachshund. 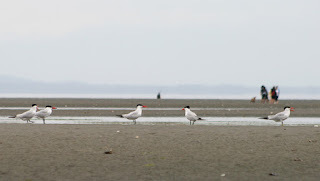 Last year a number of Caspian terns tried to nest atop the green warehouse-like building (Fraser River Inc., or something, I forget the name) at the south end of the skytrain bridge, west side. I don't believe any were successful, and I haven't seen any there this year. (You can view the roof from the bridge, or from the train.) Other places I've had good looks at them in Richmond are along the river near the Oval, and flying over the pipe at Iona. Oh, man, I LOVE Caspians. Terns in general are SO sassy and stylish and RAUCOUS. Dogs running off leash chasing every bird DOES drive me (conservation biologist). I understand it's "fun" for the dog, but it's the human equivalent of a murderer running after everyone on the beach with a loaded gun. Fun! bb, Caspians fly over our house on summer evenings, making their pterodactyl cries. They drive the neighbours' pug insane. He has no idea what he's barking at, but works himself up so much he almost falls over.